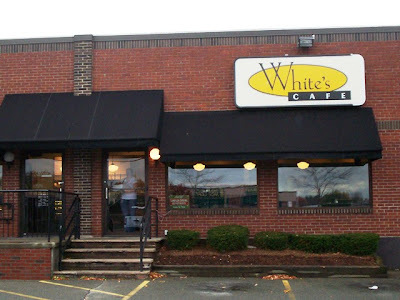 White's Cafe and Pasty Shop (in Brockton) came highly recommended by two of my former co-workers. Since Mom was in a bakery mood, we decided to "drive by" White's to see if they were open. Usually when we say we are going to "drive by," it means we are going to park, go inside, and buy stuff. With MapQuest leading us in the right direction, we arrived at White's at around 3:30 p.m. When we first got out of the car, we were unsure of which door to use. Two doors stated they were for the pastry shop, but we soon found out that the pastry counters are accessible through the cafe door, and the other two doors are entry to the bakery kitchen. Located in a small brick plaza, there was average parking and a ramp for the handicapped. When we stepped inside, both Mom and I were astounded. There was pastry as far as the eye could see. I had no idea it was going to be this big. When my co-workers described it, I pictured this tiny counter with a few fresh breads scattered along the top. Not this bakery. There were at least five or six large bakery cases along with two long tables topped with fresh pies, breads, cookies, and other treats. Mom was in heaven. If she had a hat, she would have spun around and threw it up into the air like Mary Tyler Moore. 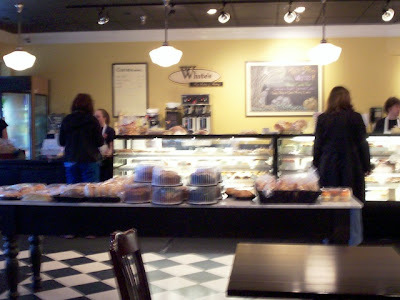 We noticed that the cafe was empty, and all the action was near the bakery display cases. The interior both in the cafe and on the main floor is quite modern. 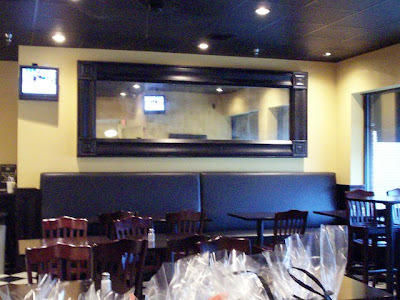 There is black seating in the restaurant with yellow walls and a black checkerboard floor highlighting both areas. 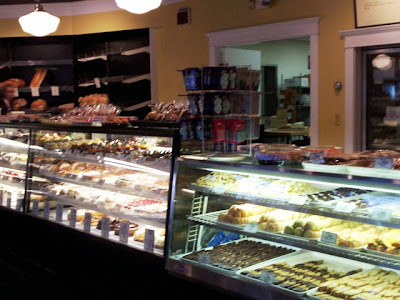 There was a lot of lighting around the display cases to make them pop, and both the dining room and the bakery area were clean and organized. There were two cash registers (one on either side of the counters) because I'm assuming that this place does a lot of business. There were also plenty of cashiers standing behind the glass waiting to take your order. Although it was not extraordinarily busy, a few customers had gathered around the goodies. Still spinning, Mom decided to organize her thoughts and start drooling at the first display case. Filled with prepared foods like spinach quiches, chicken pot pies, and ham and asparagus tarts, the meals come with heating instructions and are ready for you to place into the oven as soon as you get them home. The next few bakery cases were filled with the good stuff - sweets. There was a great section with just mini pastries such as cannolis, carrot cakes, cream puffs, eclairs, cheesecake, and Neapolitans ($9.95/dozen). 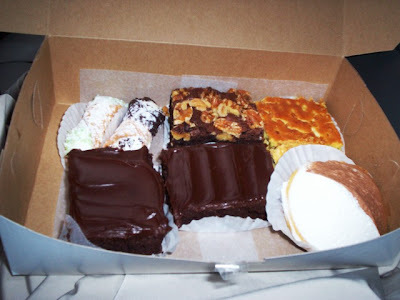 They also offer both mini pastry and cookie trays for $25 (two dozen mini pastry) and $35 (two pound cookie). Other sizes are also available. Other desserts include opera cakes, cream filled turnovers, half moons, brownies (nuts and without), cupcakes, tortes, biscotti, and individual slices of their delicious cakes. With cakes like Italian rum, banana split, black forest (from $18.95 to $176), frosted and whipped cream, midnight madness, kahlua sombrero, tiramisu, chocolate and lemon mousse, brownie torte, pavoratti, and the gateau and white gateau Charlene, there is plenty to choose from. Both the *checkerboard cake and the ricotta pie (which we didn't see) came highly recommended from a few Internet dining sites. White's also makes New York style, Oreo, Heath Bar, fruit flan, and chocolate covered cheescakes (chocolate covered - 7" is $23.95; 10" is $6.25/lb). They also offer a large variety of novelty theme, wedding, anniversary, christening, and corporate cakes. Also made fresh at White's are their delicious looking pies, such as apple, blueberry, cranberry apple, dutch apple, lemon meringue, custard (seasonal), mince, pecan, pumpkin, ricotta, squash, and strawberry rhubarb. 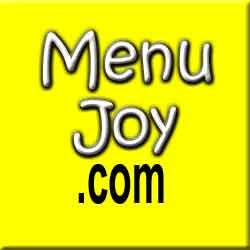 The listed pies from custard to strawberry rhubarb are seasonal only, and pies range from $10.05-16.95. Cream pies include banana, Boston (the only one not topped with fresh whipped cream), chocolate, chocolate mousse, and key lime (seasonal). These pies range from $11.50-12.95. At the last bakery display cake were all their breads and breakfast items such as muffins, danish, danish rings, turnovers, croissants, fig and lemon squares, and pecan rolls. Visions of sugar plums danced in Mom's head as she tried to make a decision. After a few spins around the counter and almost taking out a few customers, Mom was ready to order. She chose two mini cannolis (a plain and a chocolate dipped), two frosted brownies, a brownie with walnuts, a gold half moon, and a fig and a lemon square. Mom was too glazed to remember to get a receipt, but I can tell you that the total was $11.30, and the prices were individually marked on each item's tray. The polite cashier had a lot of patience to put up with Mom running from counter to counter and pressing her fingers against the glass. Although we were on our way to have a early dinner, Mom decided that she just had to try something right away. When we got to the car, she decided to pull out both mini cannolis. The reason being was that they have to be refrigerated, and since we were going to be gone for the rest of the day, we should eat them right away. Good call, Mom! They were amazing. I had the chocolate dipped one, and although the chocolate side was a little too crunchy, the delicious filling and chocolate chips made up for it. I think that you can actually taste the filling more if the cannoli has a plain shell - like Mom's did. She said it was one of the best cannolis she's ever had. The shell was fresh and crisp, the filling was cool, creamy, and very rich. She said it was not sweet and had a very nice texture. I thought I was going to have to give my mother a paper bag to breathe into while we were at White's, but when we left she was able to catch her breath and relax. This was one of the best bakeries, if not the best, that I have ever been to. There is so much to choose from, and everything is both beautiful to look at and to eat. You can tell that whoever is making these items definitely had formal training, and if they haven't, they have an extraordinary talent. Mom is already talking about her next visit, and as I type this, she's telling me that she wants to go back - NOW. Perhaps our next visit will be sooner than I think! 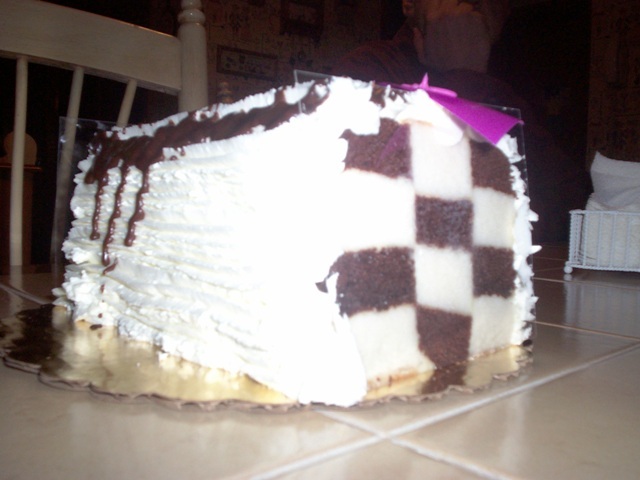 *Click here to see pictures of the checkerboard cake. DELICIOUS!